I first became aware of pop up shops as a ‘thing’ when reading an excellent Guardian Magazine article on the topic in October last year. Having just returned from the Edinburgh Fringe the idea of using temporary and ‘found’ spaces for the Arts was a very familiar one, like many fringe goers I’d experienced the temporary transformation of Masonic Lodges, pubs and even a hotel swimming pool into one of the 265 venues for the Festival. centres up and down the country as they sit conspicuously lifeless, like missing teeth in a gleaming smile. 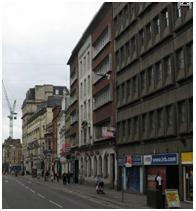 The Newport Empty Shops Project was one of the first of its kind in Wales and saw roughly 30,000 people visiting nine shops. During eight and a half months of residency the Project hosted over 1,600 days worth of activities and involved 200 local artists and organisations. Newport has shown that by encouraging such enterprise towns and cities can put creativity at their epicentre both physically and ideologically, thus getting more people engaged with the arts. You can see the spread of similar projects across the UK at the Empty Shops Network. Pop up arts spaces create a mutually beneficial relationship between commerce and culture. Retail units transformed into galleries, studios, workshops, performance spaces, and community centres bring colour and originality to the homogenized high streets that have been criticised for turning towns into characterless clones of each other. The variety and vibrancy brought by pop-ups can be utilised for regeneration projects and give run-down areas a new lease of life. Pop- Ups are evolving from the grassroots squatter culture of their origins, and Kira Cochrane’s Guardian article provides the proof that the pop-up model has been embraced (but not yet ruined) by corporations. The transient nature of a temporary shop lends an exclusivity which is coveted by designer labels and even Alan Sugar sent his would be Apprentices to run pop up boutiques in Manchester’s Trafford Centre. It looks like Pop Ups are the new ‘big thing’ in PR and marketing. In Cardiff ThinkArk has employed social design to create gallery space in Cardiff City Centre arcades and Project10 hosts quarterly contemporary art and design exhibitions in pop-up galleries. As Wales Online reports 24 empty premises on St Mary’s Street and Cardiff City Council struggle to make their vision of a vibrant castle quarter come to life, perhaps it is time we not only allow the Creative Industries into Cardiff City Centre, but welcome them with open arms!